Ukrainian troops and rebels in the country’s east have been blaming each other for sporadic ceasefire violations. Both sides say they only respond to attacks launched by adversary forces and question the possibility of heavy artillery withdrawal. The ceasefire is largely holding in eastern Ukraine, the head of the OSCE mission there, Ertugrul Apakan, said Monday. He added that the one exception was Debaltsevo, a town where an estimated 5,000 Ukrainian task force remains trapped, surrounded by rebel forces. He also said the rebels were “ready to provide a ‘green corridor’” for the troops to be able to exit Debaltsevo. They only want them to leave with no weapons and ammunition. Kiev has refused to acknowledge it has trapped military forces in Debaltsevo, a strategic railway hub that connects the breakaway regions of Lugansk and Donetsk. Military spokesman Vladislav Seleznyov also said the army would not leave. "There are the Minsk agreements, according to which Debaltsevo is ours. We will not leave," he told Reuters by phone. The Ukrainian military accused the rebels of shelling army positions 112 times over the first day of the ceasefire. They said five soldiers were killed and 25 wounded. The rebels reported 27 attacks in their direction. They accused Ukrainian troops of firing on Donetsk airport, while journalists were there. The Organization for Security and Co-operation in Europe (OSCE) said that that the ceasefire has been in place for its first 18 hours. 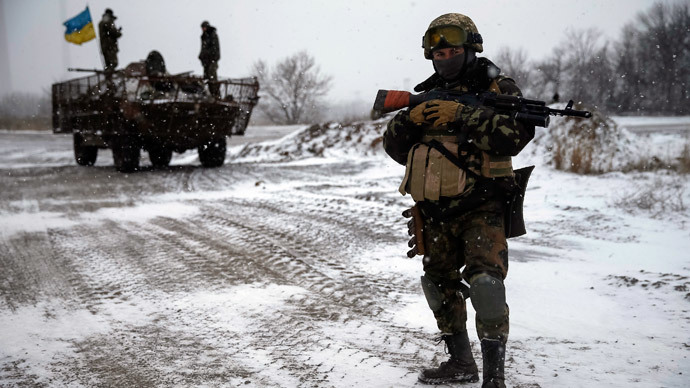 The ceasefire “has been adhered to despite some incidents in Sievierodonetsk (90km northwest of Lugansk, government-controlled), Lugansk, Debaltsevo (80 km north of Donetsk) and in Donetsk City,” the OSCE said in a report published Monday. Both sides want the other to stop shooting so that the withdrawal of the heavy artillery from the frontline, scheduled for Tuesday, can begin. “The major condition for heavy weaponry withdrawal from the frontline is a ceasefire. One hundred and twelve attacks is not a ceasefire,’ Andrey Lysenko, Kiev’s military spokesman, told journalists. "The heavy weaponry withdrawal starts only after the ceasefire. And if the Armed Forces of Ukraine do not stop the shelling, which come in violation of the Minsk agreements, the DPR [Donetsk People’s Republic] militias will not pull back their weaponry," said Eduard Basurin, deputy commander of the DPR's Defense Ministry's corps. "The situation is fragile. Particularly with regard to Debaltsevo this is not unexpected," Merkel said during a news conference in Berlin. Kremlin adviser Yury Ushakov was cautiously optimistic on Monday, saying the situation in eastern Ukraine was developing "not badly," especially if compared to what was going on before the Minsk agreement was signed. “We hope that all of the provisions of the February 12 Minsk agreements will be implemented,” Ushakov told journalists. He however believes the additional sanctions announced against Russia on Monday were in no way contributing to peace. "Our attitude remains the same – sanctions are illegal. They prevent the solution of problems, I mean Ukrainian problems, and hinder the development of relations between the European Union and Russia," Ushakov said. The latest UN estimate puts the number of casualties in the war in eastern Ukraine at 5,600 people.